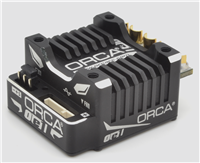 ORCA present the powerful capacitor for the ESC. Fitting for 1cell - 2cells LiPo and 2cell - 3cell LiFe, improve the ESC performance. Tamiya Brushless ESC (Electronic Speed Controller) TBLE-01 is designed for use with Tamiya Brushless Motors (TBLM Series). In addition to the 5 pre-set profiles, settings such as brake and neutral brake can be set separately. Along with its high performance, it also features 3 protection systems: overheating, overloading, and low voltage. Compatible with Ni-Cd, Ni-MH, and Tamiya Li-Fe batteries. ORCA present the new generation ESC program card, compatible to ORCA OE1 / R32X / B32 ESC featuring new firmware and hardware for more updatability friendly through micro SD card to update the latest firmware of the ESC, which is do not compatible older generation R32, VX3 ESC. ORCA present the new generation ESC program card, compatible new R32 ESC featuring new firmware and hardware for more updatability friendly through micro SD card to update the latest firmware of the ESC, which is do not compatible older generation VX3 ESC.